Lukas Forchhammer (born 18 September 1988) is a Danish singer, songwriter and former actor. 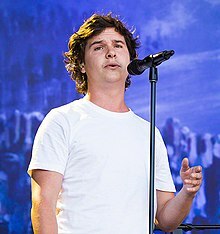 He is the lead singer for the Danish band Lukas Graham. As a child, Forchhammer starred in the Danish family movie series Krummerne. Forchhammer grew up in an anarchist community in the center of Copenhagen called Freetown Christiania. At age 8, he joined the Copenhagen Boys Choir and developed not only an appreciation for classical music but a trained voice. He became fascinated with his father's Irish roots, the country's folk music as well as hip-hop – "Dr. Dre's 2001 changed my life," he said. He related to rap lyrics as he grew up surrounded by a lot of crime and drugs in his neighborhood. His father was Irish, and he spent half of his childhood in Ireland in Cork and Kilkenny. His grandfather was from Wicklow in Ireland. In September 2012, Forchhammer's father died of a heart attack at the age of 61. After spending six months in Buenos Aires, Forchhammer returned to Christiania in 2010, where he joined the writing team Future Animals – Don Stefano and Morten Ristorp, and formed the band Lukas Graham with friends from high school. He played at the 59th Annual Grammy Awards on February 12, 2017. As a child, he also starred in the first 3 of the popular Danish movies Krummerne, where he played Grunk. In September 2016, Forchhammer and his girlfriend Marie-Louise “Rillo” Schwartz had a baby girl, named Viola. Wikimedia Commons has media related to Lukas Forchhammer. ^ "» Lukas Graham". last.fm. Retrieved October 3, 2018. ^ "Lukas Graham members open up about Danish band's success" (Interview). April 10, 2016. Retrieved September 30, 2016. Graham isn't actually on my birth certificate. ^ Treo, Thomas (December 14, 2012). "Der er krummer i Lukas Graham". Ekstra Bladet. Retrieved March 14, 2012. ^ "» Lukas Graham talk number 1's, Irish roots & wings!". Twotube.ie. Retrieved November 22, 2016. ^ "Lukas Grahams song: Faren er død". ^ "Lukas Graham Frontman Lukas Forchhammer Reveals His Daughter's Name: 'We Haven't Kept It Secret'". December 6, 2016. "Better Than Yourself (Criminal Mind Pt 2)"
"Take the World by Storm"
"Not a Damn Thing Changed"
This page was last edited on 14 April 2019, at 03:31 (UTC).